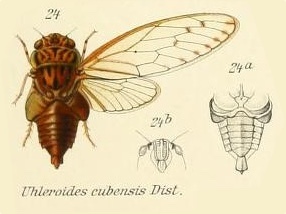 Uhleroides cubensis Distant, 1912 is a cicada found in Cuba. Characters. — Head slightly shorter than pronotum, front considerably shorter than vertex, lateral margins of both nearly continuous and both centrally, longitudinally finely Silicate; ocelli a little farther apart from eyes than from each other, vertex impressed between ocelli and eyes, the latter scarcely projecting beyond the anterior pronotal angles; pronotum shorter than mesonotum. the lateral margins moderately ampliate but not angulate; mesonotum shorter than head and pronotum together; abdomen about as long as space between apex of head and base of cruciform elevation; tympanal coverings globose and projecting beyond the lateral margins of the abdomen, outwardly complete, the orifices only exposed inwardly; opercula not extending beyond base of abdomen, lateral and apically rounded, not meeting internally; rostrum reaching the posterior coxae; face longer than broad, lateral margins a little sinuate near base, finely centrally sulcate on posterior half, strongly transverse^ striate, the lateral margins a little broadly reflexed; tegmina three times as long as broad, hyaline, eight apical areas, basal eel! longer than broad; wings about half as long as tegmina, six apical areas; anterior femora armed with two spines beneath.